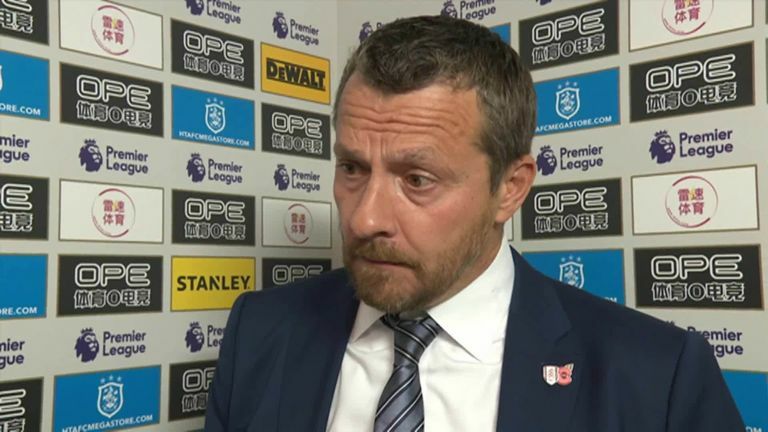 Slavisa Jokanovic says Fulham "did not show quality" during their 1-0 loss to Huddersfield which saw them go bottom of the Premier League table. The West London side rarely troubled their opponents at the John Smith's Stadium, and are now in 20th spot with five points from their opening 11 games. Jokanovic admitted that side did not deserve to win the Monday Night Football clash and they 'quality' in their performance. "We didn't deserve much today if I'm being honest. In the first 45 minutes, we did not have intensity, and it did not give us enough space to move the ball, and we were kicking it without any sense," he told Sky Sports. "We put another midfielder in for the second half, but still missed the quality. "I don't know [why it happened]. To be honest, we are without power or intensity, especially before half-time, we didn't show quality either. "The players are under some kind of pressure, they may be are scared about the possibility of something like this." The result will only increase the pressure on Jokanovic, with Fulham spending £100m on new players in the summer but with little reward on the pitch. "I trust in myself, people know I am here for three years, they know how I work, and we are in some kind of process," he added. "It has not started well. There are many games ahead of us, we are at the bottom at the moment and that's extra pressure but we must prove ourselves. "I convince myself and that's it, I don't need to convince other people or think about that. I am thinking about myself and my team. "The process is a long one, after 11 games Crystal Palace were bottom last season with four points. Everything is open, we are not at our best level and we need to improve."